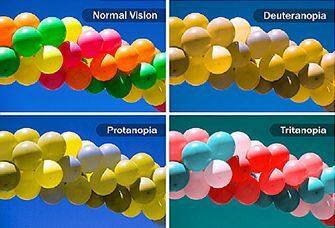 Color Blindness - What Is Color Blindness? Color blindness means your eye doesn't see color the way it should. Your eyes see differences in the light that comes in. It’s a bit like the way we hear sounds as being low or high. This is called pitch, and it corresponds to the frequency of the sound, or how many times it vibrates in a given time period. The keys on the left side of a piano keyboard make low-frequency sounds. The frequency rises as you go to the right. There’s a similar order to the colors we see. The colors of every rainbow always appear in the same order: red, orange, yellow, green, blue, indigo, and violet. The different colors in each part of the rainbow correspond to a different wavelength of light. Reddish colors have a long wavelength. Bluish colors have a shorter one. Just as there are many notes on the piano, many wavelengths of light match the different colors. How Does Your Eye See Colors? Rods only have one kind of pigment. It reacts the same way to any light wavelength. Rods don’t have anything to do with color vision. But they are very sensitive to light and allow us to see at night. When the cones have all the various pigments -- called photopigments -- your eye sees all possible colors. If there’s a problem with the pigments, you won’t see colors the way you should. This is called color deficiency or color blindness. If just one pigment is missing, you might only have trouble with seeing certain colors. If you don’t have any pigments in your cones, you won’t see color at all. This is known as achromatopsia. Usually, genes inherited from your parents cause faulty photopigments -- molecules that detect color in the cone-shaped cells, or “cones,” in your retina. The most common types happen when genes you inherit from your parents that help make the photopigments in the cones of your eyes don’t work properly. Sometimes this means you are less sensitive to some colors than others, and sometimes it means you can’t see certain colors. Deuteranomaly: It’s the most common form of color blindness and affects 5% of males, but is rare in females. It happens when the green cone photopigment doesn’t work as it should. Yellow and green look redder, and it’s hard to tell blue from violet. Protanomaly: Your red cone photopigment doesn’t work as it should. Orange, red, and yellow look greener, and colors are less bright. It’s usually mild and doesn’t cause problems in daily life. It’s rare in females and affects about 1% of males. Protanopia: You have no working red cone cells. The color red simply looks black. Some shades of orange, yellow, and green look yellow. It’s rare in females and affects about 1% of males. Deuteranopia: You have no working green cone cells. Reds may look brownish-yellow, and greens may look beige. It affects 1% of males and is rare in females. This is when your blue cone photopigments are either missing or don’t work correctly. It's the second most common type, and it affects males and females equally. Tritanomaly: Your blue cone cells work in only a limited way. Blue looks greener, and it can be hard to tell pink from yellow and red. It’s extremely rare. Tritanopia: Also known as blue-yellow color blindness, you have no blue cone cells. Blue looks green, and yellow looks light gray or violet. It’s extremely rare. Also called monochromacy, you don’t see any color at all and your vision may not be as clear. Cone monochromacy: It happens when 2 of your 3 cone cell photopigments -- red, green, or blue -- don’t work. When only one type of cone works, it’s hard to tell one color from another. And if one of your faulty cones is blue, your vision may not be as sharp, you may be nearsighted, and you may have uncontrollable eye movements -- a condition known as nystagmus. Rod monochromacy: Also known as achromatopsia, it’s the most severe form of color blindness. None of your cone cells have photopigments that work. As a result, the world appears to you in black, white, and gray. Bright light may hurt your eyes, and you may have uncontrollable eye movement (nystagmus). Does Color Blindness Cause Other Health Problems? The kind that’s present at birth doesn't. Most people who are colorblind lead normal and complete lives. The condition might keep you from a job -- like a pilot -- that requires a certain level of color vision. If you think you have a problem with color vision, talk to your eye doctor right away. She can tell you if you’re seeing colors properly and what to do if you aren't.